With just a laptop and a dongle, GeoSLAM data can be seamlessly downloaded, processed and viewed within minutes of capture – wherever you are. 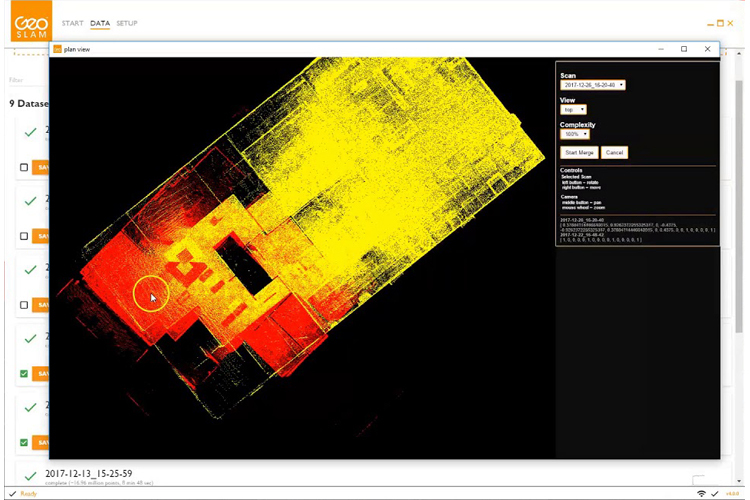 The software, based upon our industry-leading SLAM algorithm, is used to automatically register data captured from our hardware to produce fully-referenced 3D point clouds. As SLAM requires no GPS input the software can be used to dynamically process mapping data from both indoor and outdoor environments, while on the move. Accurate ground referencing can be achieved either by scanning known survey points or by integration with existing georeferenced point clouds.